When King Martin I (the Humanist) of Aragon died in 1410 he had no children to succeed him, and he had not named any successor. The only written law of succession was the Will of James I which confirmed the principle of male primogeniture, but (as we shall see) this was not followed. Six claimants to the throne stepped forward. Through intrigues and political gerrymandering the law of succession was set aside, and a group of nine electors (three from each realm of Aragon, Valencia and Catalonia) was put together to decide upon the respective claims. They met at Caspe in Aragon in 1412, and by the very composition of the group a decision for one of the claimants, Ferdinand of Antequera, was assured in advance. 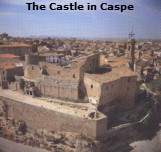 Therefore the event known to history as ”the compromise of Caspe” was not a valid election. When in 1213, Peter II died on the battlefield of Muret, his son, James I, was only five years old and in the custody of his father’s conqueror. After negotiations the child-king was released and escorted to Catalonia. It was then decided to entrust him to the Templars at Monzón and the regency (procuracio) to his great-uncle, Sanç of Provence. James later recalled that both Sanç and his uncle Ferrado “had the hope of being king”. In the summer of 1214 the cardinal-legate Pierre de Dovai, on behalf of the king, summoned a general cort at Lérida, where all those present were required to swear fealty to the king. There can be little doubt that these events were remembered by James I when in August 1270 he wrote his third and last will. The testament makes it clear that the throne was to descend in agnatic-cognatic succession, from the male line of his second wife Yolanda, but both the Lords of Xerica and Ayerbe (James and Peter, his sons with his third wife Lady Teresa Gil de Vidaure) were recognized as heirs to the throne, should the male line from Yolante become extinct (as it did). The testament was ratified by the Pope and became the first formal order of succession to the lands of the Crown of Aragon. The only valid claims to the throne would be dynastic in male primogeniture. 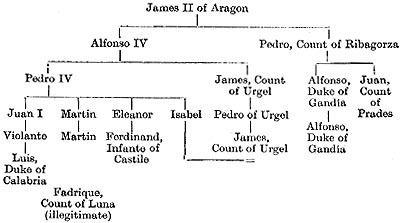 The first claimant was James of Urgel who based his claims on the fact that he was the great-grandson of Alfonso IV (who was the great-grandson of James I). The second claimant was Alfonso, Duke of Gandia, son of Peter Count of Ribagorza and grandson of James II. 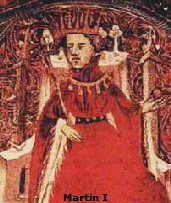 Alfonso died in the course of the discussions about the succession and his son, also named Alfonso, took his place. The third claimant was Louis, Duke of Calabria. He was the son of Violante of Anjou, who was daughter of King John. The fourth was Ferdinand of Antequera, Infante (Prince) of Castile, son of Eleanor (who had married John of Castile) and grandson of Peter IV. The fifth claimant was Frederick, Count of Luna, an illegitimate son of the Infante Martin (son of King Martin I, but had died before his father). The sixth was John, Count of Prades, brother of the first Alfonso (the second claimant), thinking his rights were better than those of his nephew. The fifth claimant, Frederick, could not have any real dynastic claims as he was not born of a legitimate marriage. As James Count of Urgel, Alfonso Duke of Gandia and John Count of Prades all claimed and could verify succession in the male line, their claims were better than the claims of Louis Duke of Calabria and Ferdinand Infante of Castile (as they could only claim succession through the female line). It is quite clear that of James, Alfonso and John, the person being the closest relative to Martin was James of Urgel. Also J.N. Hillgarth in “The Spanish Kingdoms 1250-1516” says, when discussing the “compromise” of Caspe, that “among the descendants in the male line, the closest relation to Martí was Jaume, count of Urgel …” (op.cit. vol 2, p. 229. Any successor other than James of Urgel must have been appointed on grounds other than dynastic and so in opposition to the Will of James I and the law of succession. This point is also stressed by T.N. Bisson, who when discussing the “compromise” of Caspe points out that “… the issue was (or became) political rather than simply legal, a utilitarian question of which candidate with some dynastic claim would make the best king” (“The medieval crown of Aragon”, ss. 135-6).